Legendary Scottish rockers NAZARETH has stuck to their guns for over 40 years. New release Big Dogz has that original ’70s rock spirit — raw, dirty and reckless. Original vocalist Dan McCafferty still has that distinctive raspy Highlands howl that has made NAZARETH so recognizable. NAZARETH also boasts original bassist Pete Agnew, who has songwriting credits on every song. They are joined by Agnew’s son Lee, who joined on drums in 1999 and Jimmy Murrison, who’s been in the band since 1994. Big Dogz is being touted as a true recording; no ProTools, no overdubs, no studio trickery. Produced by Murrison, the sound is tight and crisp. Big Dogz has 11 new tracks of classic rock ‘n’ roll. 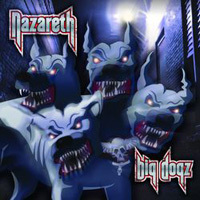 NAZARETH has always had a heavy blues/R&B influence, and on songs “When Jesus Comes to Save the World Again,” “Lifeboat” and “Big Dog’s Gonna Howl,” that influence really stands out. “The Toast” will remind you of something off of Malice in Wonderland. They don’t really let loose on a lot of songs, but they do play with a steady hand and a heavy groove. It doesn’t have the balls that Hair of the Dog or No Mean City has, but it will remind you of their glory days. The old NazDogz still got it!